With over twenty years of designing fashion for some of Washington D.C.’s top foreign ambassadors and figures in the community, Samia Qureshi introduced her new line of KuKu handbags, studded and elegantly designed with authentic Swarovski Crystals. Samia’s perspective on design and aesthetics is truly a blend and marriage of eastern concepts and western contemporary styles. Having lived in Lahore, the older and more historic city in Pakistan, Samia has been heavily influenced by the middle eastern art that is so prominent in that region. After coming to the United States to start a new life with her loving husband, Naveed, and their two american born sons, Haseeb and Aneeb, the two quickly worked hard to attain the lifestyle that they both had wanted, and dreamed of when becoming United States citizens. 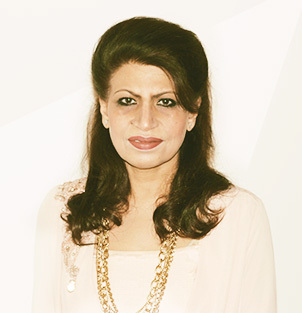 While raising a family, Samia had taken her clothing business from very humble beginnings to a thriving business receiving wholesale orders and attending different trade fairs, to designing strikingly beautiful evening dresses and garments for distinguished diplomats and foreign ambassadors. Her reputation precedes her, as her name and elegant designs would be the topic of numerous dinner parties and charitable events. It was at this point in her career, that her passion for intertwining the east and the west had accounted for her success. It was this same passion that had led to the creation of the KuKu line of Swarovski Crystal handbags. Samia’s goal with each KuKu handbag is to bring eastern motifs and aesthetics to western lavish elegance, so that the person wearing a KuKu handbag is essentially wearing a hand crafted piece of jewelry, perfectly accenting a particular outfit or attire for the evening. As an established designer, Samia has found success with her KuKu line across seas in Europe and in Southeast Asia, and locally in the D.C. metropolitan area. Working hard on each design takes talent and skill. For Samia, great design also takes the right eye for looks. Samia is changing evening fashion. With stunning and luxurious handbags, she guarantees each handbag will be the centerpiece of any party. Intertwining eastern and western cultures and motifs with luxurious crystals makes KuKu’s luxury handbags a must for the social elite and high-fashion minded.